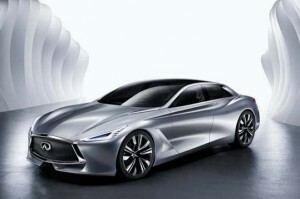 Infiniti Motor Company, Ltd. is commemorating its 25th year anniversary with a celebration of its first-ever technologies and offering a look forward to the future with the debut of its Q80 Inspiration Concept at the 2014 Los Angeles Auto Show. The Q80 Inspiration builds on the brand’s heritage of driver enhancement technologies, incorporating both active and passive safety features and wrapping them in stunning sheet metal that showcases potential future design themes to be found in upcoming products from the automaker. From the outside, the Q80’s striking four-door fastback-style design underscores the advanced technologies found within the car. The Q80 Inspiration includes a technology suite of cameras, lasers, sensors and artificial intelligence which provide an ongoing dialogue between the vehicle and driver via a Head-Up Display (HUD) projected on the windshield. The system suggests a course of action, which can be employed by the driver through a button on the steering wheel. The final decision—whether to accelerate and overtake or to brake and fall in behind the car ahead, for example—always rests with the driver. In addition to offering next-generation enhanced driving capabilities, the Q80 Inspiration features an efficient-yet-powerful twin-turbo 3.0-liter hybrid electric V6 powering all four wheels and capable of producing as much as 560-hp, while returning fuel economy of nearly 45 mpg. Inside, drivers and passengers of the Q80 Inspiration are greeted by a refined interior. Anchored by four bucket-style seats that – like the rest of the cabin – are finished in a mixture of leather, Alcantara and metal, occupants are bathed in natural light from the car’s sculpted panoramic glass roof. Infiniti brought the RearView Monitor, or back-up camera, to market more than a dozen years ago on the 2002 Infiniti Q45. This type of technology is now slated to be mandated on all cars sold in the U.S. in 2018. 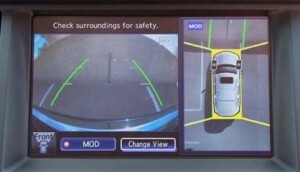 Infiniti was first to offer an Around View Monitor on the 2008 Infiniti EX35, a four-corner, virtual 360-degree, bird’s-eye view of the vehicle when parking. This driver aid was later enhanced by adding Moving Object Detection, which can help alert drivers to the presence of animals, pedestrians or other moving objects around the parking vehicle. Infiniti pioneered Lane Departure Warning on the 2005 Infiniti FX, designed to help address the National Highway Traffic Safety Administration’s (NHTSA) findings that showed more than half of all traffic fatalities were due to some type of lane departure. Infiniti then expanded and enhanced its warning system with the world’s first Lane Departure Prevention system on the 2008 Infiniti M, which helps the driver bring the vehicle back into the lane of intended travel. Infiniti introduced Blind Spot Intervention (BSI) on the 2011 Infiniti M. Engineered to alert the driver of a vehicle in the adjacent lane during lane change maneuvers, BSI can help the driver bring the vehicle back into the lane. Infiniti’s Backup Collision Intervention system, first introduced on the 2013 Infiniti JX, detects cross traffic and large stationary objects behind the vehicle when backing up and can both warn the driver and engage the brakes momentarily to help the driver avoid an impending collision. A world’s first system that can warn the driver of risks that may be obscured from the driver’s view, Infiniti introduced Predictive Forward Collision Warning (PFCW) on the 2014 Infiniti Q50. PFCW can not only sense the relative velocity and distance of a vehicle directly ahead, but also of a vehicle travelling in front of that, alerting the driver to slowing or stopped traffic directly ahead. 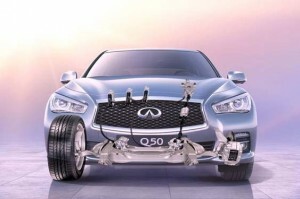 In 2013, Infiniti became the first automaker to introduce a “steer-by-wire” system in a production car. The 2014 Infiniti Q50 offers Infiniti’s Direct Adaptive Steering™ which, transmits steering inputs electronically instead of mechanically, providing quicker and more precise response, as well as unsurpassed levels of customization. Direct Adaptive Steering lets the driver personalize steering modes, effort and response, while reducing the transmission of negative feedback from rough roads through the steering column. Infiniti’s Active Lane Control system, first offered on the 2014 Q50, senses unintended lane drift and can automatically make slight changes to the tire angles and steering wheel torque, helping the driver to make fewer manual steering corrections in freeway driving situations.